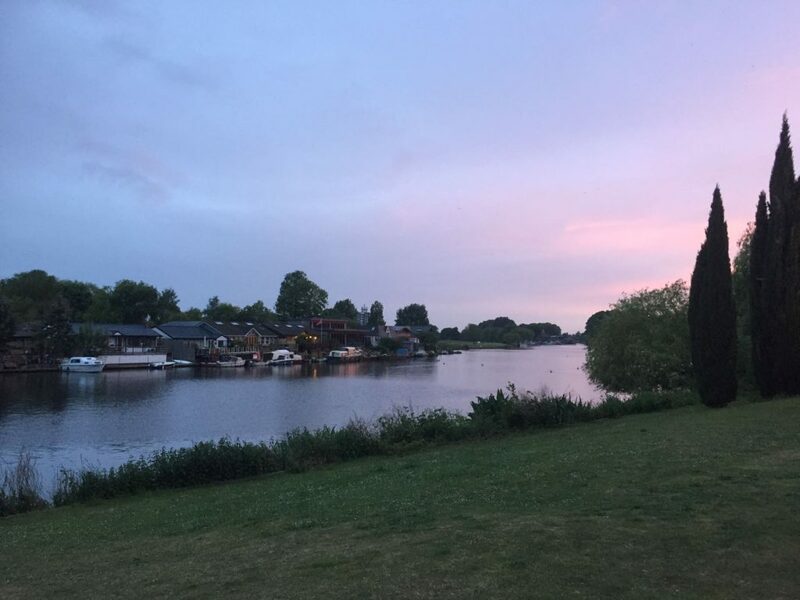 Patrick Moyle has carried out a number of inspections to thatched roofs in recent months and these include a property in Oxshott, Surrey. 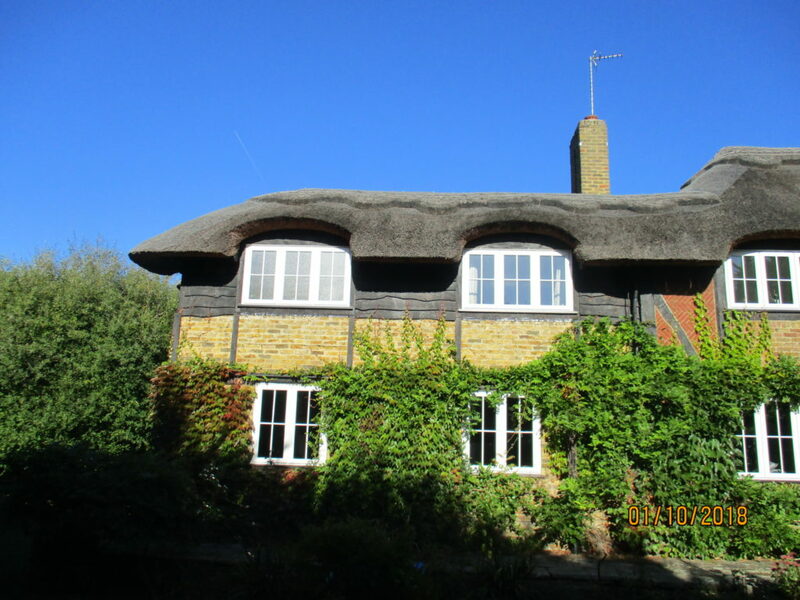 The property dated back to the 1930s however the house had been extended and completely rethatched. Although the thatch was only a few years old the standard of workmanship was poor and major stripping back and recovering was required. 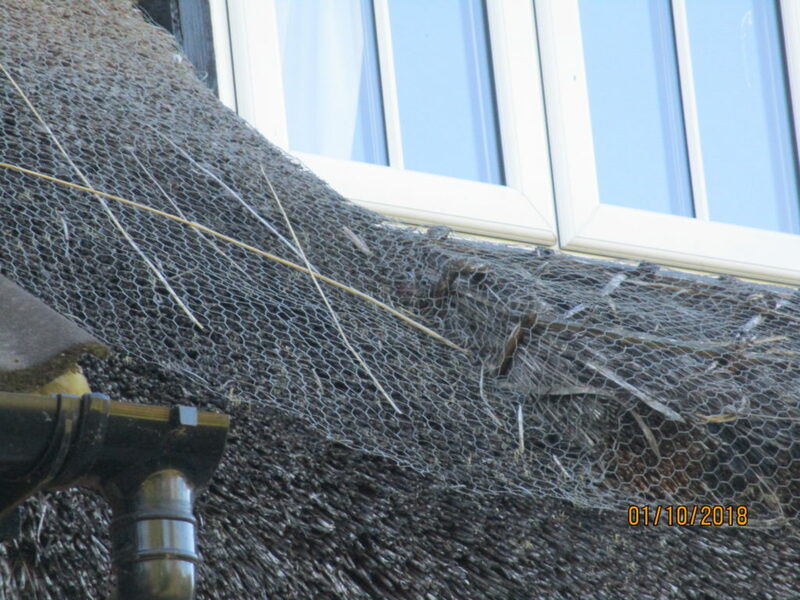 Thatched roofs are attractive but do require regular checking and inspection especially before purchase. 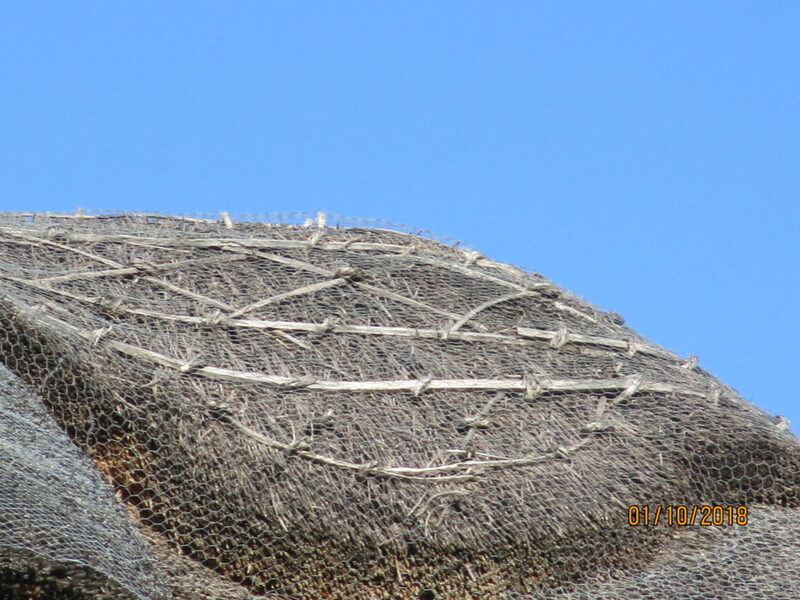 The roofing block and other sections, especially around windows, were poorly detailed and materials had weathered within 5 to 6 years whereas normally a ridge should last at least 10 years. If you are considering purchasing a property with a thatched roof please contact Patrick Moyle for further advice and information. 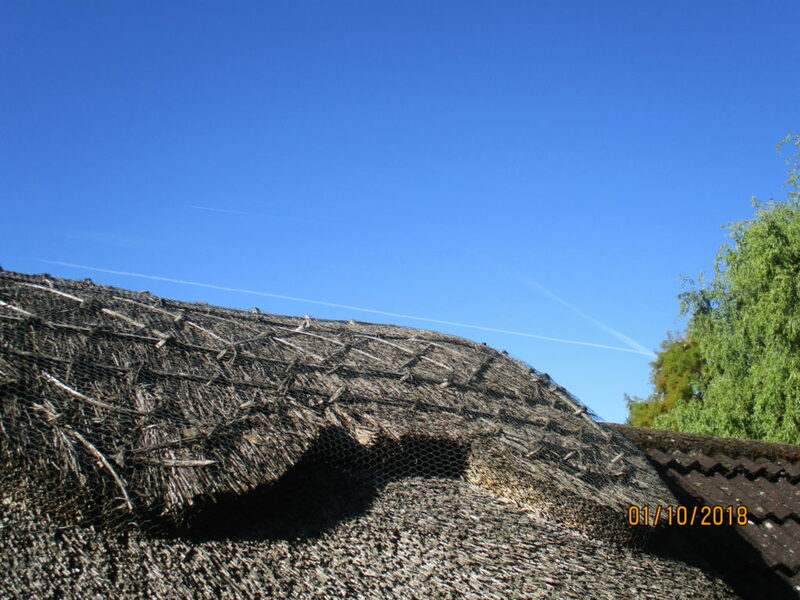 Patrick in his career has inspected numerous thatched roofs throughout Surrey, Sussex and Kent and also in Devon. 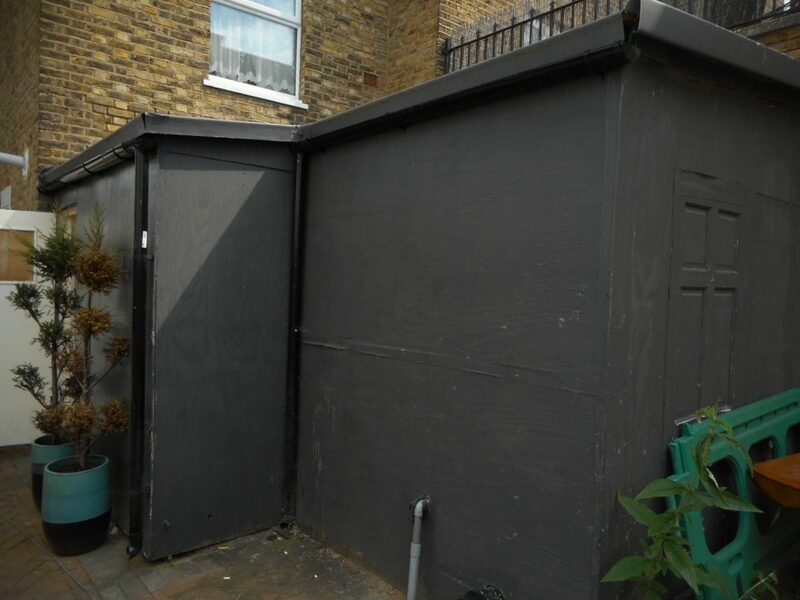 We were recently instructed to carry out a Valuation on a terraced commercial unit in Tooting, London. 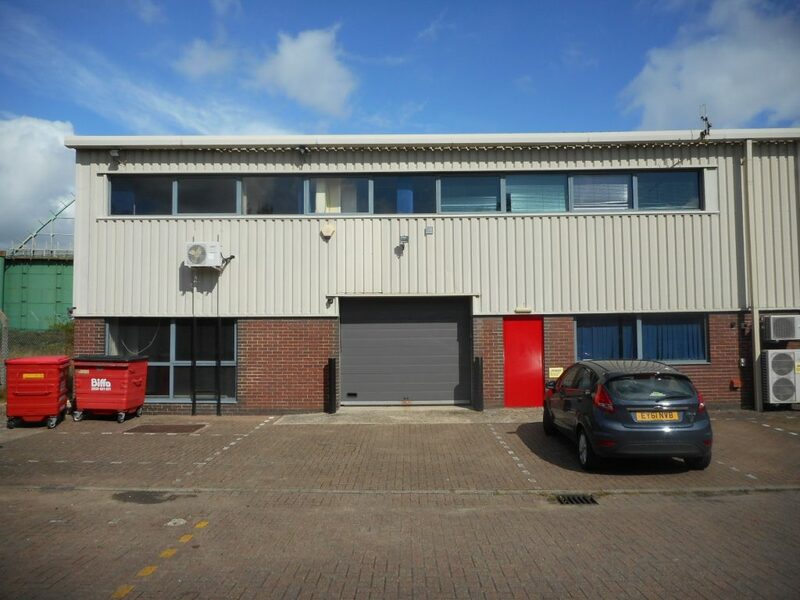 The property has been poorly maintained and is in need of total refurbishment. 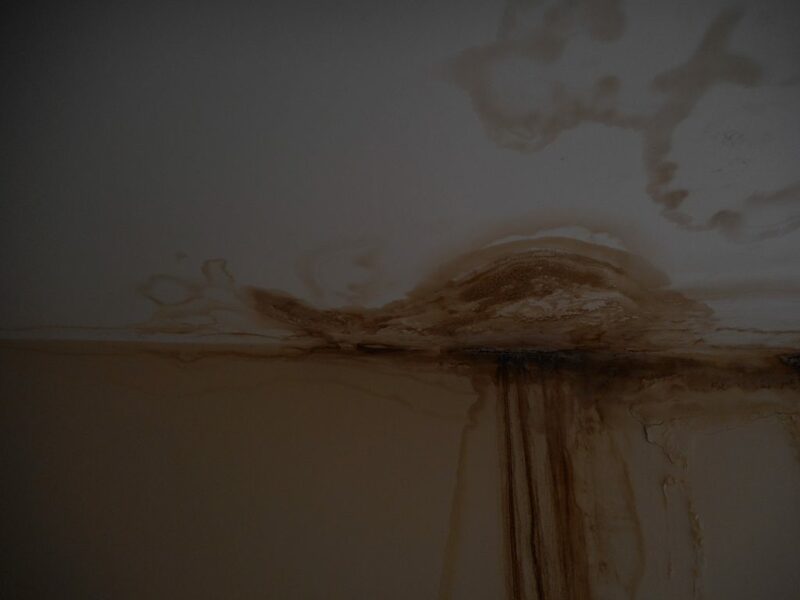 The flat roof is in particularly poor order and the lack of care taken over the building has lead to the major leak evident in the photo below. It is vital that owners/tenants try to maintain their properties to avoid major remedial works and prolong the useful working life of the building. This week our Surveyor, Patrick Moyle, has surveyed a property at Horley near Gatwick Airport for a client who is wanting to take on a Full Repairing Lease. A detailed protected Schedule of Condition has been prepared. The property was built around 1990 and is therefore 27 years old. 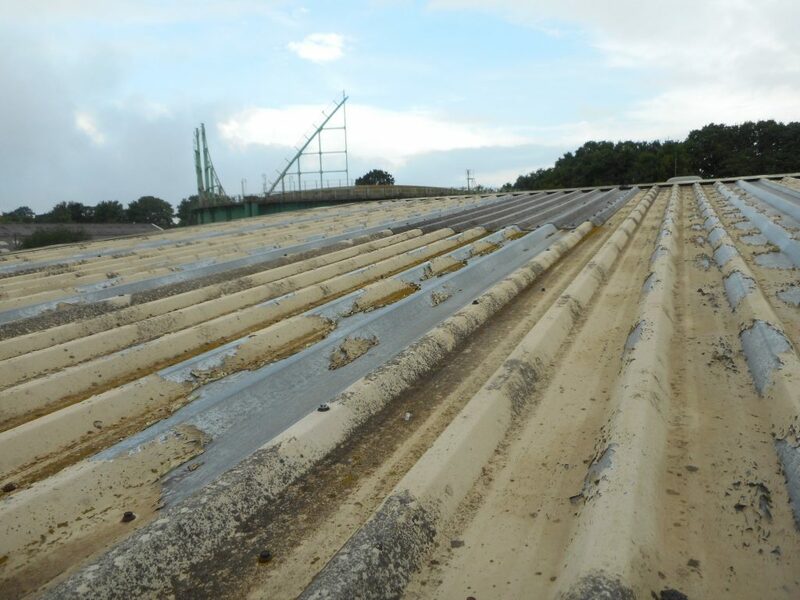 The roof covering although only 27 years old, is in very poor condition with Cut Edge Corrosion having occurred – steel work sheeting is corroding at the edges and the paint finish has curled up and deteriorated. 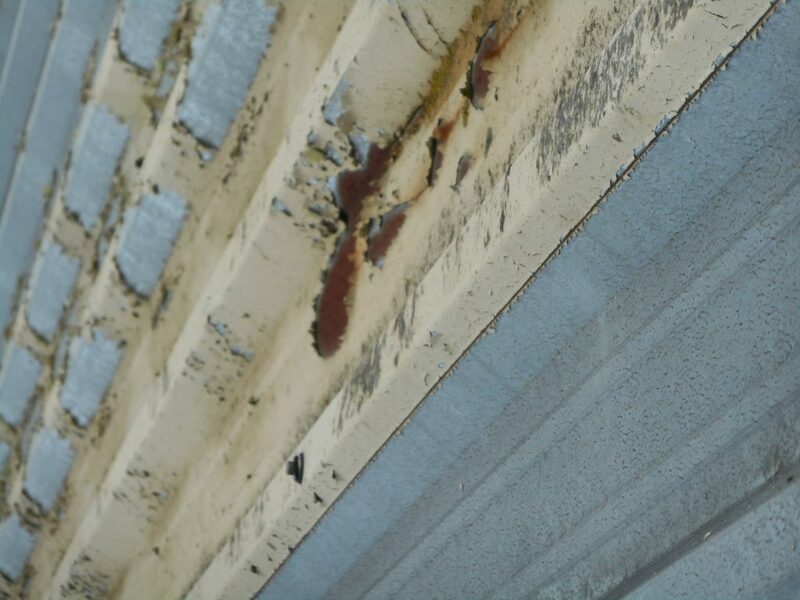 Also the paint finish has deteriorated to the main area and the galvanising has failed resulting in corrosion. The plastic roof lights have all discoloured. 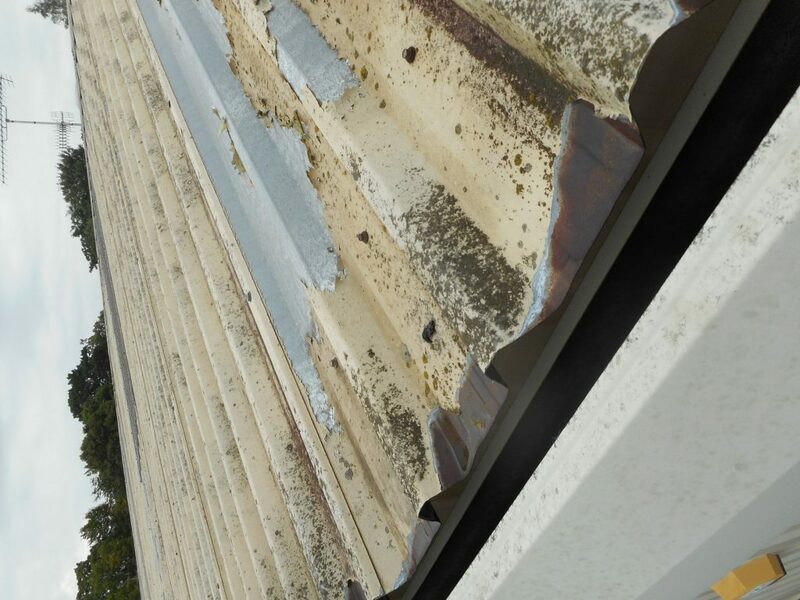 The roof now will have a limited life and we have advised our client of the short life span of the roof covering and that any future repair or renewal must be specifically excluded from the lease to ensure that to endure repair and maintenance of the lease they do not have to pay a considerable amount of money. It is important when negotiating a lease to attach a Protective Schedule of Condition to it to ensure that no dilapidation issues arise at the end and to ensure that dilapidation costs are kept to a minimum. Our Survey also discovered numerous other issues with the building. As well as carrying out Surveys and Valuations we actively Project Manage many refurbishment and construction projects for our clients. 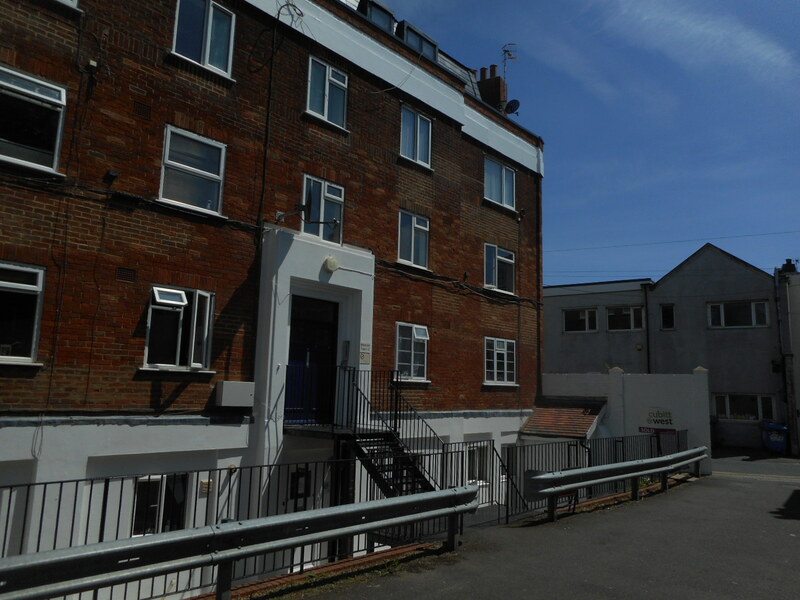 The photo below is of a project we are overseeing in Brighton, It is the external refurbishment of two blocks of flats, The first block as seen below is practically complete and we are happy with the outcome. We are very experienced in project management and contract administration. 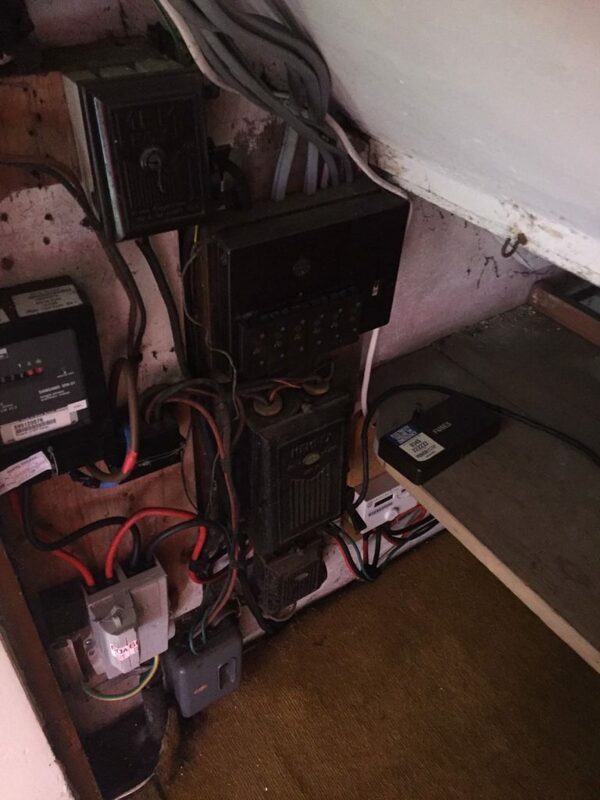 We recently carried out a Condition Schedule on a property in Mitcham, London. This timber framed structure has ply wood walls and roof, with very little insulation. All joins were taped and painted over in this grey colour. You can also see that the rear wall has a redundant door making up part of the wall!! We come across many strange structures and nothing surprises us anymore! 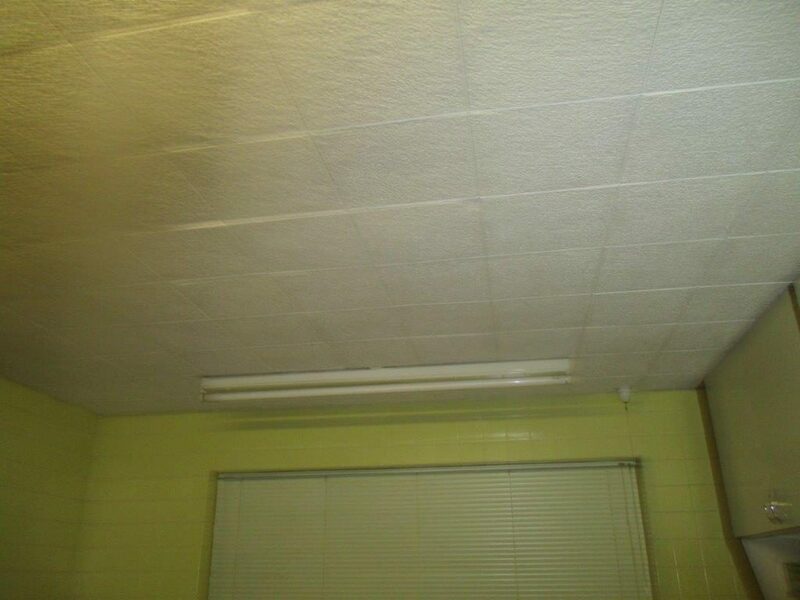 Polystyrene tiles were very popular in the 1970s/ 1980s as a form of decoration to the ceilings of a house. 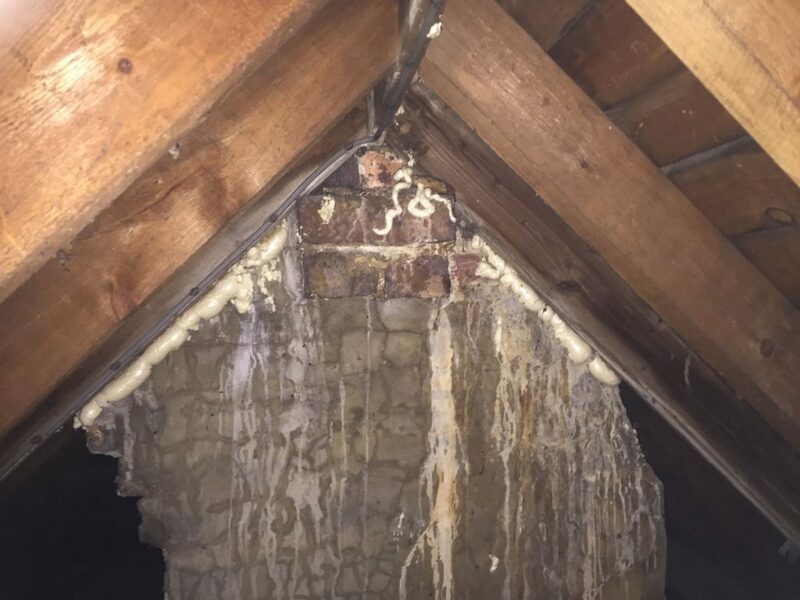 It is rare to come across polystyrene tiles now, but if we see it we recommend that they are removed as they pose a fire safety risk to the property, this is relatively easy and cheap to do. This photo was taken in Croydon whilst carrying out a Condition Schedule. Recently we carried out a Full Building Survey on a property in Caterham, Surrey. This property is generally in poor repair and in desperate need of refurbishment. 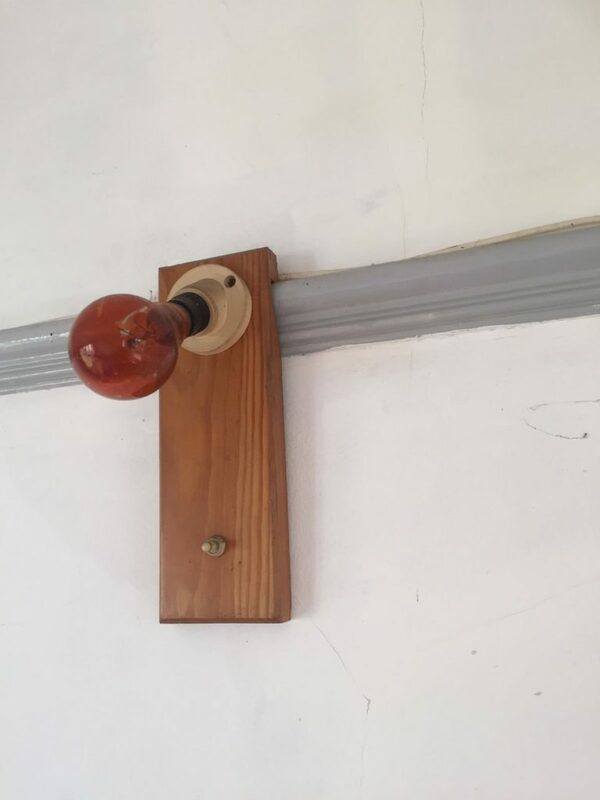 Throughout the property there are many examples of poor DIY including the wiring below, along with home made light fittings! We come across many peculiar and different things throughout our inspections and nothing surprises us anymore! Whilst on a Full Building Survey in Fulham London, we noticed this poor attempt of general roof maintenance. The problem is that the lead flashing on the chimney is defective and water is getting in, instead of getting the lead flashing replaced, they have opted to spray expanding foam in the gap in order to try to stop the water ingress. From the photo you can see that this obviously hasn’t worked! 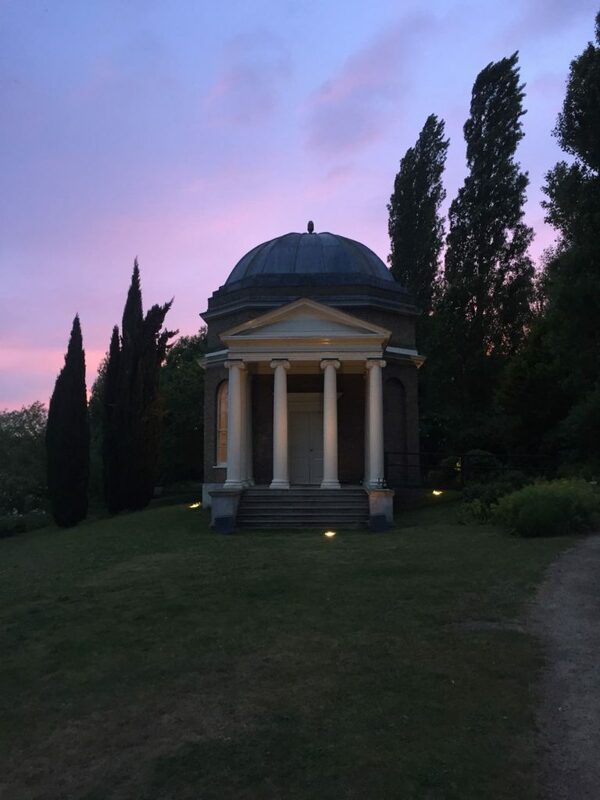 We recently carried out a Full Building Survey on a property in Dorking, Surrey. 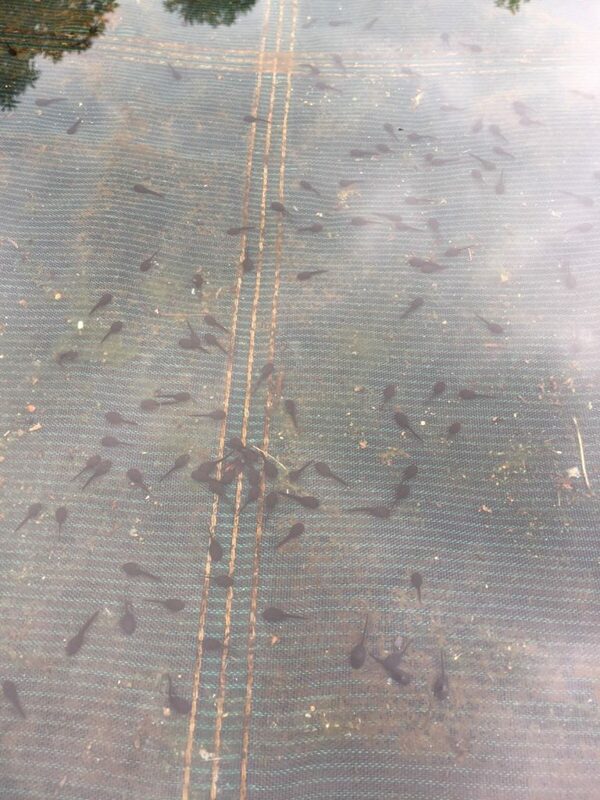 The rear pool looks as though it is slowly turning into a pond! The plant life and Tadpoles in the water indicated that the water has not been chlorinated or maintained properly for a very long time! Routine maintenance is important, especially with expensive luxuries such as swimming pools. If you would like to speak to one of our friendly team regarding any of our services please call us on 01737 245947.